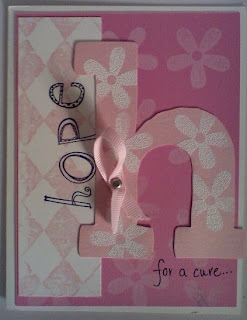 In honor of the October being Breast Cancer Month, I would to present a pink card a week. Anyone that knows me, will be shocked to see that I even have PINK cardstock... but come on, I have a daughter who rides up and down on a "whether or not PINK is cool or not" roller coaster! LOL. So I have to have some shades of the color, and there are enough out there I can live with. With the "hope" that soon a cure is found, or that more people have better "awareness" of cancer, I will donate my cards to a local hospice. I actually believe this card might be a year old... I found it in my stash recently and was like.. OH its almost October. Breast Cancer Awareness Month. FANTASTIC NEWS! As of August 16, 2008 ta-tas® Brand is proud to introduce our ALL NEW non-profit sister company The Save the Ta-tas Foundation. The Save the ta-tas Foundation exists for the advancement of cancer awareness, education and prevention, and to aid in the fight to find a cure. 5% of all sales of ta-tas Brand products will be donated toThe Save the Ta-tas Foundation. The Save the Ta-tas Foundation will continue to support outstanding organizations that lead the way in the fight against cancer, such as The Revlon Run/Walk for Women and more. Stay tuned for our Grand Opening and Website Launch scheduled for September 9, 2008. TFL and feel your tatas this month!! !